Bruker Contour Elite 3D optical microscopes combine Bruker’s ContourGT platform’s industry-leading metrology, easy-to-use Vision64 analysis software and exceptional new imaging capabilities. Contour Elite is fast and accurate, delivering repeatable results for advanced R&D and production, along with the imaging and display advantages of confocal microscopy. Determine surface finish, critical angles, spacing, radii and other dimensions. Contour Elite 3D optical microscopes ensure high vibration tolerance and measurement repeatability, even in manufacturing environments with tight production specification limits. A large field of view and objective magnifications from 1X to 115X enable characterisation of a wide range of surface shapes and textures. Optional high-resolution colour or monochrome imaging reveals surface details that otherwise would be difficult or even impossible to see. Rapidly select areas of interest and collect critical metrology data from specific regions. With high speed and accuracy, Contour Elite 3D optical microscopes are ideal for QC/process monitoring. They also have the sensitivity and stability necessary for precision 3D surface measurements in applications that are challenging for other metrology instruments, such as advanced QA/QC and R&D applications in the high-brightness LED, solar, semiconductor and MEMS markets. Critical metrology includes measuring film thickness, layer and substrate roughness, and monitoring and validating dimensional parameters such as RA roughness, pitch, width and height. Contour Elite microscopes offer the best combined lateral and vertical resolution and the industry’s largest field of view, with a sub-nanometer to >10mm vertical range. 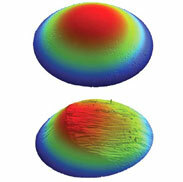 High-fidelity imaging reveals minute surface details that would otherwise be difficult or impossible to see. Data segmentation based on color or grayscale information enables users to rapidly select areas of interest and collect critical metrology data from specific regions. 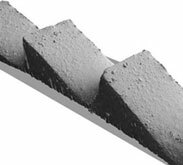 See the sample along with its true 3D topography, for better problem-solving in engineered surface applications. 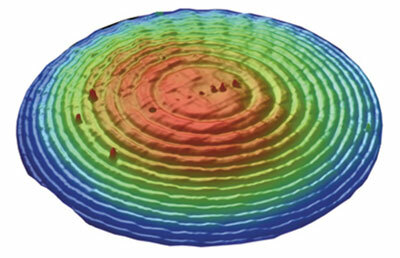 Left: 3D height map of a printed circuit board (PCB) with colour image overlay. Contour Elite 3D optical microscopes can be used to screen for defects (eg scratches and pits) in orthopedica implants and other medical devices. Lateral and vertical thresholds are defined by the user, with automatic part rejection and reason logging for optimised process control. Even drug coatings can be measured for roughness and thickness, in addition to the material inside the coating. Contour Elite microscopes can measure samples of various shapes and sizes, different material types and have a large dynamic range for very rough to extremely smooth surfaces. Acquire data-rich, three-dimensional images, with superior resolution and repeatability, to gain greater insight into part performance and functionality. Understanding surface wear and its underlying causes is critical to the manufacture and maintenance of automotive and aerospace parts, such as bearings, seals, drive trains, shafts and brake components. The advanced surface metrology and imaging capabilities of Contour Elite 3D optical microscopes help engineers understand wear and correlate wear to a particular manufacturing process or wear mechanism. Contour Elite combines multiple measurements into a larger dataset, in order to characterise areas more accurately and in greater detail. 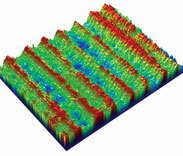 Highlight data trends such as waviness, lay or a predominance of ridges or scratches. Shafts, mating or connecting surfaces, and close-tolerance or irregularly-shaped parts are often challenging to measure. Contour Elite is able to measure difficult areas such as shaft interiors, quantitatively and repeatably. 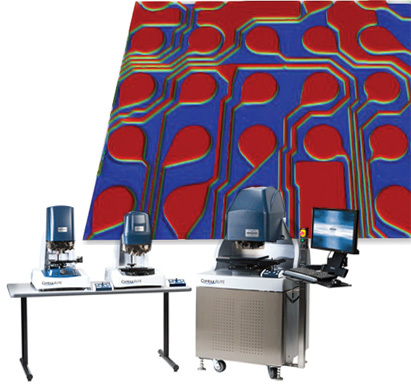 Custom investigation of surface data provides thousands of different analysis parameters. High-fidelity greyscale and colour imaging, combined with Bruker’s side illumination and advanced algorithms, allows users to collect accurate metrology data with corresponding surface images for complete surface characterisation. Left: 3D surface analysis of a brake rotor.